Sadly at this point there is no plugin available for Linux, however the people over at the mono project are working on moonlight so we should see some movement in that direction soon. Once you have done that you should create a folder somewhere on your hard drive where you want to store your files. 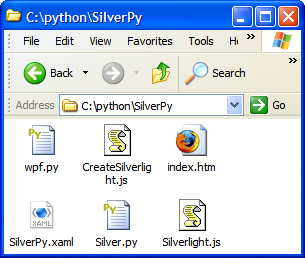 I created a folder called SilverPy. Note: The DLR sample appears to have gone missing in recent SDK releases, but it can be found on the samples page. Then copy all of the files from that folder into your SilverPy folder. Now rename the DLRConsole.xaml to SilverPy.xaml and you can get rid of the DLRConsole.py, in its place create a SilverPy.py file. This will be the file that will contain our python code. Defines the CreateSilverlight method, which invokes either the CreateObject or CreateObjectEx method, which are defined in the Silverlight.js file. tag settings in the HTML file for hosting the Silverlight control. If you want more information on the nitty gritty of these these two files and the html file please read the Microsoft website. 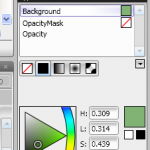 Defines an area within which you can explicitly position child elements by using coordinates relative to the Canvas area. So this where we will create all of our visible objects, you can think of it like the canvas that a painter uses. You can see in the XML that we give our canvas object a name: “root_canvas”, a height, a width, and a background colour: “purple”. The next element that you see is an x:Code element which we use to load the “Silver.py” python file. Here we could load as many code files as we wanted. The next element is another Canvas element named “game_canvas”, which serves no purpose except to provide us with the . The value that we assign to the loaded attribute is the name of the function in our python file that will be called when this canvas has been loaded. For some reason (perhaps it is explained somewhere or someone can tell me why) I could not get the “root_canvas” to send the Loaded event, so I needed to created the sub-canvas as a work-around. The next element is a TextBlock element that is used to display (yes you guessed it) text. We use this TextBlock to display the user’s score as they play our little game. Now it’s time to work on our python code. If you load the index.html file into Internet Explorer (you have to use Internet Explorer as there currently are some issues with loading external python modules when running local files, I’ve read that it will be fixed soon) you will get an obscure error. This is because we have not created the on_canvas_loaded function that we described in our xaml. The first thing that you will notice about out Loaded event handler is that it has two parameters, which is common will all event handlers. Sender is the object that fired the event, and e is the event arguments associated with the event. What is contained in the event arguments changes depending on what event is being caught. So far so good! So now lets get into some serious python coding, now most of this code is simply Python/IronPython so if you are familiar with both you shouldn’t have any problem. Now we are going to work with two classes in our game, one class that will be the target that we are going to aim at and the other that will serve as out main game. @param game_canvas – The canvas for the game. Now the first thing that we do is we create a random object that we will use in the future to position our Target sprites. The next step is to save the game_canvas that was passed in to the __init__ function, game_canvas corresponds to a canvas object. Then we initialize our score to zero, this will be the number of canvas sprites that our user hits. Then we create an empty list, which will store references to the targets that are currently on the screen. Finally we hook up our member function on_key_down to the game canvas objects KeyDown event and set our done flag to False, since we aren’t done. This handler is pretty simple, it gets called when there is a key down event on the game_canvas, if the key is the Escape key (e.Key == 8) then we called self.game_over() to end the game. I added this so that someone could quit the game at any time. The first think that we do is create a TextBlock object, set some of its properties, and add it to the game_canvas’s children making the object visible. Then we use a helper function in the wpf module to set the position of the TextBlock object. Finally we set done to True, done is simply a boolean flag that we use to know if the game is done or not. Now here we do something interesting, we create an ellipse object using some in-line XAML code instead of creating the object directly like we did with the Ã¢Â€Âœgame overÃ¢Â€Â text. After the ellipse has been created, we set the Height and Width, and then we add it to the canvas objects children. Then we use the SetPosition helper function in the wpf module to set the position of our ellipse. Then we add a handler to the ellipse’s MouseLeftButtonDown event. We do this so that we know that the user has Ã¢Â€ÂœhitÃ¢Â€Â a target. These are simply defines that we use to pass into the notify function in order to tell it what event has happened. @param event – number – What has happened? Now I hope you can see what is happening, we don’t have any game play just yet, but we have started working on the interaction between our sprites and the main game object. This function is pretty straight forward, if we got the GAME_OVER event then we call the game_over function and everything finishes. Which I think is some pretty cool and intuitive interaction between our xaml and our python code. Now because of the way that Silverlight works we cannot simply use a normal game loop, instead we use a Storyboard object which is generally used for animations. What we do is tell the storyboard object to Begin its set of animations, but since there are no animations set up, it promptly quits and the Completed event fires, which we handle with the self.on_game_timer function. What we do when our Storyboard ends is we update all of our targets, then if the game has not finished we restart the Storyboard, and the game loops. #We have hit the bottom! Game over! Now if you’ve made it this far in the code there shouldn’t be anything surprising about this, we basically initialise our TargetGame using the root_canvas, and then we tell that game to run, that’s it. So that’s it, you can go play the game here if you want: http://www.learningpython.com/silverpy/index.htm my highest score is 93. @param notify_function – function – The function to call when an event happens. TargetSprite will be added to. @param velocity = 1 – int – How fast we are going to move down. while (len(self.targets) < NUM_TARGETS): self.targets.append(self.create_target()) def create_target(self): #Create a new target and return it #Init to random size and position x = int(self.random.random()*400) width = int(self.random.random()*30) + 20 height = int(self.random.random()*30) + 20 y = 0 – height “””Init the velocity to a random number based off of the score so that more targets are hit, the game gets harder.””” velocity = int(self.random.random()*(int(self.score / 15)+1)) #The minimum velocity is 1 if (velocity<=0): velocity = 1 return TargetSprite(self.on_target_event , self.game_canvas, x, y,width, height , velocity) def on_target_event(self, event, target_sprite): “””Called when an event is sent from the target sprite @param event – number – What has happened? @param target_sprite -TargetSprite – The sprite that has sent this event””” if (self.done==True): #We are already done don’t bother return if (event == GAME_OVER): #The game is over! self.game_over() elif (event == TARGET_HIT): “””A target has been hit Remove the hit target from the list and from the canvass””” self.targets.remove(target_sprite) self.game_canvas.Children.Remove(target_sprite.ellipse) #Update the score and the score text self.score += 1 Score.Text = “Targets Hit: %d” % (self.score) #Now make sure that we have enough targets self.ensure_targets() def run(self): “””Start the game.””” #initialize the elements self.done = False self.score = 0 #Our storyboard timer self.gameLoop = wpf.Storyboard() #Set the name property for the 1.1 refresh self.gameLoop.SetValue[System.String](self.gameLoop.NameProperty, “GameLoop”) #Add to the canvas self.game_canvas.Resources.Add(self.gameLoop) #Add the completed event handler self.gameLoop.Completed += EventHandler(self.on_game_timer) #Start the game loop self.gameLoop.Begin() def on_game_timer(self, sender, e): “””This is the main game loop that we are going to be using.””” #Update the sprites for sprite in self.targets: sprite.update() #If we are not done, start the timer again if (not self.done): self.gameLoop.Begin() def on_canvas_loaded(sender, e): target_game = TargetGame(root_canvas) target_game.run() [/code] All in all it’s pretty simple to create something like this using Silverlight and python. Hopefully this tutorial provides enough information so that all of you can create your own game or application, if you do drop me a line I’d love to check it out. As always if you have any questions, comments, or spot a problem with the tutorial, add a comment below. Thanks for your tutorial which is exactly what I was searching for but unfortunately I have a little problem. I’m on Vista and I’ve installed Silverlight from the link you gave. This download “Silverlight.1.1.AlphaRefresh” version on my PC. (It ask to install Silverlight which is already installed). So I’m note sure what’s going on. Maybe there is a new version 1.1 called “Refresh” and examples done with the previous 1.1 doesn’t work anymore. EDIT: Forgot to mention that I tried with both IE7 and Firefox with the same results. All right francois, sorry it took me so long to get back to you but I finally figured out what the problem is and I think that everything should be working now. Give it another chance and let me know what happens. I really like your website. I’ve created something similar, http://my-python-blog.freehostia.com/, but it will take a more formal approach. So anyway, I have a couple tutorial requests. Can you post a tutorial explaining how to make exe, dmg, bin/deb/rpm files? And can you create a tutorial about porting your pyMan game to Jython? Yuval! That’s very cool! It’s great to see more and more people learning python. Keep up the good work. Jesus – Yeah, I’m looking into that, hopefully there will be something soon! what digg, reddit ect plugins are you using? Thanks selsine, your example works great now! Unfortunately I can’t follow the tutorial. When I download the “Refresh” 1.1 SDK (the only one available now) I can’t find the files you mentioned (DLRConsole.xaml, wpf.py,etc). Maybe I’ve missed something obvious but it seems to me they’ve changed many things in the “Refresh” SDK. If this is the case could you update the tutorial or tell me what I’m missing. Thanks Selsine for the link! So it looks like it loads SilverPy.xaml but don’t know what to do with the canvas tag?? Oopos the silverPy.xaml paste don’t appear in my post above. Is there a way to show tags in a post reply here? Try wrapping the xml in [ code ] [ /code ] (without the spaces) that way I can take a look at it and see if there is anything wrong with it. Have you added your handler to your .py file? So I tried to change the Type to Type=”text/ironpython” but that doesn’t work either. Hmm what is the contents of your python file? Ok I’m not sure that worked so I sent to you a mail directly. Like I saw in your mail I’ve changed textblock to TextBlock (also I didn’t point to the good Python file which didn’t help, silly me…). I enjoyed your article, and am excited about IronPython and Silverlight. Keep up the good work. The real reason I am writing though is to save your visitors extreme frustration. I clicked on the Python Web Hosting link (at the top of your site’s page: Creating a game using python and Silverlight 1.1), and was taken to http://www.micfo.com. I’ve signed up with these people about 2 weeks ago, and have experienced a great deal of pain. Their service doesn’t work. Their systems (hosting and accounting) are terrible. They advertise a 30-day money back guarantee, yet I find myself spending valuable time trying to get them to refund my money (they claim that the transaction is not going through because of PayPal and an invalid invoice number). Well, I never used my PayPal account (used MasterCard), and the invoice number I gave them was what they had given to me. When I signed up, it took 3 days to get my account set up – which ended up not working. They run a joke of an operation. NEVER, in my 20 years of business have I been so annoyed or played with. To add insult to injury, I am being spammed by their virtual server (which was supposed to be cancelled because it is missing all kinds of modules) at the rate of about 150 emails per day! I have all sorts of emails from me to them, and their replies to back all of this up. Please consider removing this link. It’s hurting you – for recommending them as an ISP. They are a joke – and a HUGE waste of time. This is Vince from SocialRank. We’re launching a new Web 2.0 site dedicated to cycling and we have started indexing your blog posts as part of our content filter. Congrats on the new domain! Keep up the good work! I can do some neat stuff now knowing I can use Python as a scriptiong language makes stuff alot easier! I realize this is most lekily a request from the client but the IE7 only issue makes your company look incompetent.Also, as you guys appear to showcase Silverlight for your client, it doesn’t make their cross platform plugin look very friendly to the web development community. and Paradise, both presented as versions of modern American cities such as San Francisco and Los Angeles. Next Next post: PyLan a GTD todo application written in python and PyGTK – part four context menus!